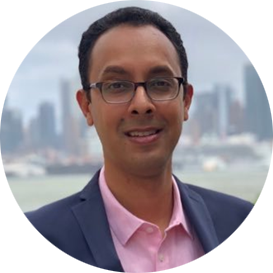 Even as Apple approaches a trillion dollar valuation and launches the 10th edition of its storied flagship smartphone, it is re-inventing its retail strategy. Sixteen years since its first brick and mortar location, Apple’s stores lead the world in revenue productivity per square foot. Apple (still) offers brick and mortar retailers much to learn. While many covet its retail success, few are able to flatter through imitation. In 2014, Apple hired former Burberry CEO Angela Ahrendts to integrate its retail (stores, web, app, contact center) strategy and operations. Under Angela, Apple has aggressively moved to position its retail stores as an integral part of the Apple experience versus a separate physical expression of its brand where it sells product. First “store” was dropped from its brick and mortar locations (and its mobile app) so that its commerce destinations became - just “Apple” (so typically meta). More recently, Apple referred to its stores as “town squares”, while at the same time re-stating its retail mission as that of unifying communities. Even though Apple seems to continuously parody itself with its never-ending “our best iThing ever” shtick, roll your eyes at your own peril. A channel-based view of retail performance is fundamentally broken, and a channel-agnostic intent requires a corresponding leadership structure and culture. Angela Ahrendts’ role at Apple includes responsibility for everywhere Apple interacts with customers in its ecosystem - stores, web, its Apple store app and contact center. Apple does not report same store sales growth, nor break-up its retail revenue by channel. Yet, among its brick and mortar peers, Apple’s integrated and agnostic view of its channels is the exception rather than the rule. It is time we stopped dumbing down important issues to drive apocalyptic click-bait. No, retail is not dying because a bunch of over-extended, poorly managed retailers are going out of business (and some that can’t seem to get there fast enough). No, retail is not alive because a tally of store openings and closings shows more stores are being opened than closed. A corollary to #1 above is retailers’ inability to assess their stores’ economic value to the enterprise in an environment where the lines between channels have blurred to the point of being meaningless. That is traditional brick and mortar retailers’ fundamental cultural and systemic transformation challenge. Apple already uses its stores to offer education, customer service and product exploration. It is now doubling down on the idea that the role of its stores is to be an expression of how consumers use its products, and the role Apple plays in their lives. Two-thirds of Chicago’s latest Magnificent Mile town square is dedicated to large, open, communal spaces that offer little opportunity to buy product. That is till you realize, Apple’s new, redesigned stores are the product. The moment retailers can find a greater calling for why they have stores in the first place, they will begin to craft their own answer to the question of the economic value of the store to their enterprise. A few are making the right noises: Walmart is beginning to position the value of its stores to strengthen its ad platform. More retailers are using catchment area attribution to understand how the presence of a store impacts online sales in that region. Nordstrom is experimenting with a merchandise-free “local” shop concept that features a spa and cold-pressed juices. Abt Electronics has always put the experience first, and recently added Dylan’s Candy Bar to its single-location behemoth in Glenview, IL. Apple doesn’t limit its “it just works” philosophy to technology products. 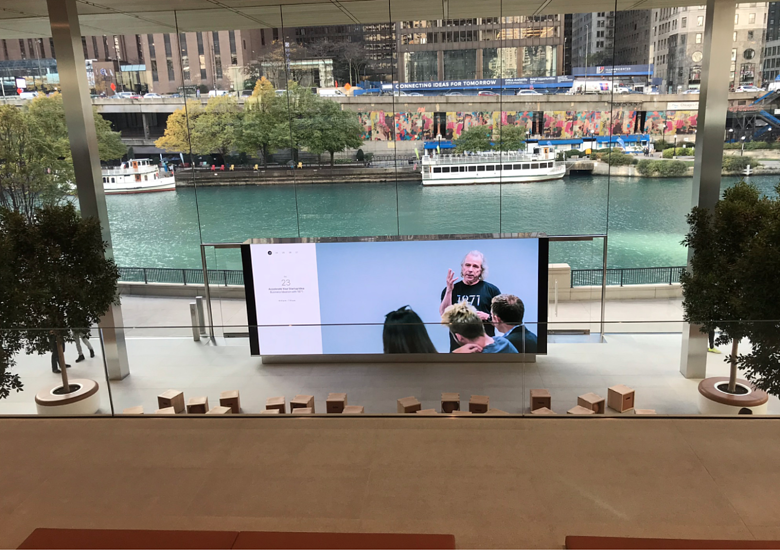 For a brand that welcomes over a half a billion visitors into its physical spaces each year, it is Apple’s ability to consistently deliver an amazing experience that sets it apart. 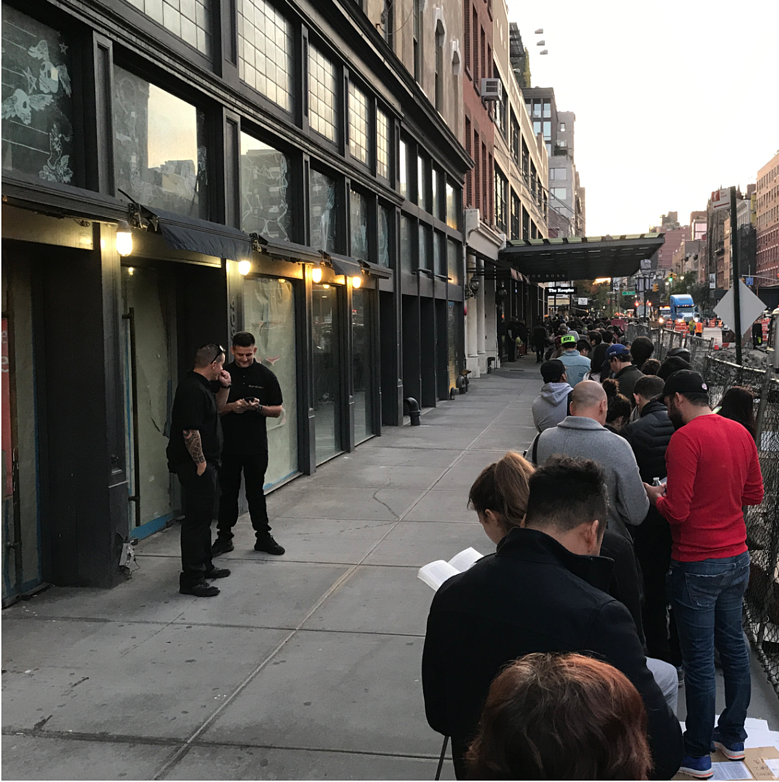 With welcome assistance from a tasker on TaskRabbit, I experienced iPhone X launch day madness first hand. What I observed was a well-oiled store operations machine going through its motions with ease, managing a highly charged horde of excited “fanboys” with warm precision, while at the same time ensuring that the frustrated customer with a screen issue or dead battery walking in that day for a Genius Bar appointment still gets the same Apple experience they expect. Central to Apple’s customer experience is the role its store associates play as its front line. The retail industry’s average store employee turnover rate is 65% (and over 100% for certain formats and certain times of year). Apple’s is 19%. It is no accident. A large part of Angela Ahrendts’ role includes leading Apple’s store teams, offering them the tools, training and incentives to first be amazing at their jobs. Beyond the obvious enablement employees receive through deep integration of Apple’s own products, Ahrendts publishes weekly “three thoughts in three minutes” YouTube style videos, designed for and delivered directly to Apple’s retail store employees to drive excitement, focus and alignment with the shared brand vision. Gaurav Pant recently recapped his thoughts from a masterclass with Jim Sinegal - the storied co-founder and former CEO of Costco. Jim famously asked retailers to turn their inventory, not their people. Over the years, many retail CEOs toasted his success, but few paid heed his advice. Reflecting on Apple’s success offers another opportunity to re-frame the conversation about “digital transformation” to first be about engaged and empowered employees. We must remain curious about what makes the world’s best tick. Consumer industry enterprises of all sorts - retailers, consumer brands, restaurants, healthcare organizations, retail banks - must be willing to learn and willing to change if they are to continue to remain relevant in their consumers’ lives. Apple’s retail success offers three important lessons: For once and for all demolish those internal structures around “channels”. Find a greater purpose for your physical spaces, perhaps by focusing on how your customers use your products or services. Sweat the operational detail, the intricate threading together of process, people and systems to deliver an experience that “just works”.